Canterbury Breweries supply draft beer in kegs to many of the South Island's drinking establishments. These kegs come in 25kg or 50kg sizes and are recycled through a system that sees full kegs leaving the brewery on wooden pallets and empty kegs returning from the pubs and restaurants on these same pallets. The brewery chose to fully automate the keg handling process some years ago with the help of Auckland-based JMP Engineering. 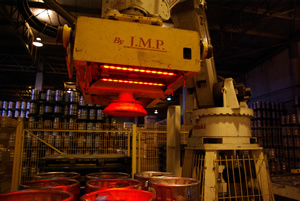 JMP installed a Kawasaki palletizing robot to "de-palletize" the empty kegs, removing them from the pallets and placing them on the in-feed of the keg washer. 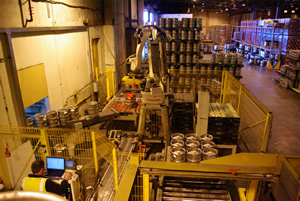 The same robot also fetches full kegs - placing these on pallets, and handles moving pallets around where needed. On the in-feed side of this solution the system required machine vision sensing to identify the position of the empty kegs on the pallet since these are manually placed and their exact positions are unknown. While the system on the whole worked well, the original choice of vision system led to unreliable and unpredictable results. A significant amount of intervention was required - with the system at times requiring constant "nursing" by an operator. JMP and ControlVision where asked to provide a vision retrofit package that would improve performance of the overall system. The retrofit solution comprised a custom designed substructure with a new Cognex In-Sight vision sensor and high output LED lighting. This substructure could be mounted into the robot tooling with minimal down-time using existing outer-arm wiring and fixing holes. Electrically, the vision sensor controls the lighting directly and takes power from the outer arm. An Ethernet connection back to the robot controller is used for all communications between the robot and vision sensor. Success in this application hinged on two key pieces of technology: Robust pattern matching and accurate robot-to-vision calibration. Locating kegs requires pattern matching on keg centres. Keg centres are highly reflective, and even under controlled lighting each can look slightly different. A pattern matching algorithm that copes well with this variation was important. 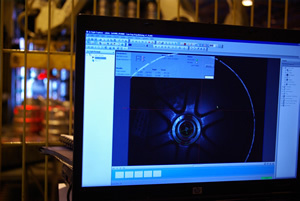 Also, once a keg centre has been located, the vision system must be capable of capturing an accurate "target position" for the robot so that it can move onto the keg. The Cognex PatMax pattern matching algorithm performed superbly during pre-production trials locating 5,000+ kegs without a single failure. The vision calibration features provided by the product where easy to use and provided excellent accuracy, even with points on the very periphery of the field of view. All software changes were made off-line and installation and commissioning took place with only a single day of down-time. The system has been in production since October last year. "Improvement in cycle-time and reduced operator intervention are clearly noticeable" says Greg Hamburger, project manager for Canterbury Breweries. Cycle-time improvement comes from the need for fewer robot moves to locate kegs prior to picking. The need for operator intervention has all but been eliminated. Where operators once needed to attend to the system several times an hour due to unreliable vision performance, they can now spend their time more productively on other tasks.